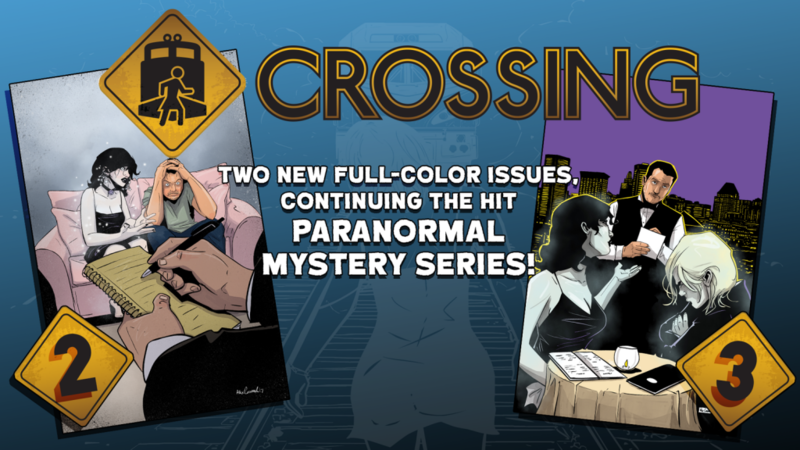 I just got the first 3 issues of the CROSSING. These 3 issues are well done and super interesting. The way the universe works and the connection between Ghosts and the Conductors are amazing. Also, add the fact that ALEX CORMACK from SINK fame is doing the art! This book simply kills it. I was blown away by the writing and art. The story kept me asking questions and really trying to understand what makes crossing such a dynamic indie book. 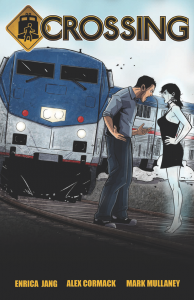 The story is about a rookie train conductor is haunted by the ghost of an annoying goth chick who threw herself in front of his train. She swears her death was a murder made to look like a suicide and she won’t “cross over” and leave him alone, This book quickly explained the rules of ghost quickly and without long drawn out speeches. This book is fun and a must have for anyone wanting to try something new. Enrica Jang and Alex Cormack put together a MASTERPIECE!! Alex brought me over but Enrica made me a fan. I will read any book with either of the guys names on it.